Control Assessment Template; these are used to qualitatively evaluate Threats and Assets in RM Studio. Users can add their own Asset or Threat Evaluations or change the definition of the Standard Asset and Threat Evaluations. To add a new Control Assessment Template click the “Add Control Assessment Template” button (1) and give the Evaluation Template a name. When you have a new Evaluation Template highlighted in the list on the left hand side you will be able to “Add value” by pushing the appropriate button (2). 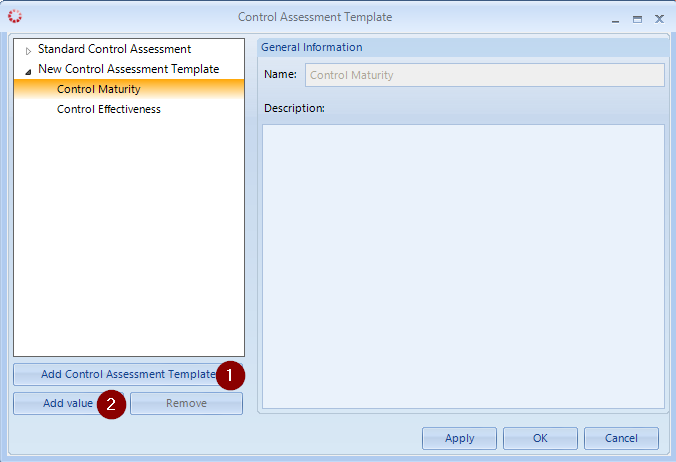 Every Control Assessment Template can hold more than one Template Value. When Asset Evaluation Templates are in use they can only be partially modified, such as changing the definitions of factor values as well as the defaults for security risk calculations. If an Evaluation Template has no Template Factor then it cannot be used as either a Threat Template or as an Asset Template for a new Risk Assessment. If an Evaluation Template has any Factor Value equal to 0 (zero) then it cannot be used as either a Threat or Asset Template for a new Risk Assessment. There may not be more than one Evaluation Template with the same name, names should be unique for each Template. There may not be more than one Template Factor in the same Evaluation Template with the same name. Names of Template Factors should be unique within a single Evaluation Template. There may not be more than one Factor Value in the same Template Factor with the same name. Names of Factor Values should be unique within a single Template Factor. Every change made to the Standard Templates will affect the calculations in the Processes using the default factors. The algorithm used for calculating security risk is most accurate when factor values start at value 1 (one) and the increment between values is 1 (one).